I’m married to a chocoholic. He’ll eat anything if its chocolate. I like chocolate, but…I’m a lot pickier than he is, as well as there are times when I want a sweet that is anything but chocolate. 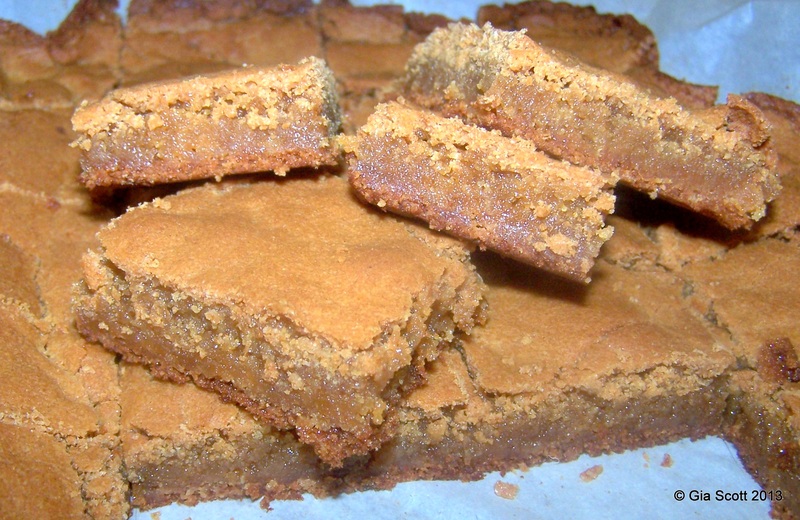 For some reason, early this morning, I woke up and had butterscotch brownies on my mind. I’ve never made them, but it was something that my mother made often when I was a child. It was one of her standard recipes to serve when she wanted cookies and bars to serve to guests, and there were times when she made enough of that kind of thing to stock an average small bakery too. She not only baked for her own entertaining, but on occasion would bake for friends & relatives. I suspect she was very good at it, which meant that I had a high standard to live up to as I started baking and cooking. But I’d never made the butterscotch brownies. I’m not sure why either. As I recalled, they weren’t something that was difficult, but they were both delicious and popular with guests. So…this morning I had my mind set on making some and recreating that delicious delight from my own childhood. I wanted the brownies, but I did not want to go to the store to buy supplies. So…I improvised, and somehow, I came up with a brownie that tasted very similar to hers, as well as had the same richly sweet candy-like flavor. These are just as caramel-ly, chewy, and candy-like as my mom’s were. I didn’t use most of the stuff the original recipe I used called for, like ground walnuts (she’d never have done such a thing!) or the butter either. I compromised and substituted since I was also out of brown sugar. Here’s my new & improved recipe. Preheat oven to 350 degrees F. Line a 9×13″ baking pan with parchment paper. Combine melted shortening, sugar, molasses and vanilla. Add eggs and stir until evenly combined. Add flour mixture to egg mixture 1 cup at a time and stir until well blended. Spread dough in prepared pan. Bake in hot oven for 20-24 minutes or until inserted toothpick comes out clean. Just before it is done, it will puff up slightly, then settle down again in a flat surface–it’s only a minute or two until its done. Do not over bake or you will have rocks instead of chewy bars! The centers are somewhat gooey while hot, but congeal as they cool to create the chewy caramel-like texture. Lift brownies out by edges of paper and set on counter to start cooling. Cut while barely warm and cool before removing from paper. Chewy & candy-like, these Butterscotch Brownies will satisfy any sweet tooth. This entry was posted in Budget, buffet, Cookies & Bars, Desserts, Easy, Entertaining, Make-Ahead, Recipes and tagged brownies, budget, butterscotch, caramel, cookies, dessert, family, old fashioned. Bookmark the permalink.